Almost 40 years ago, A Walk through Tullamore by Michael Byrne was published with a map of the town and a numbered commentary on the history of the streets and buildings. This was updated some years ago with Exploring Tullamore, a short printed guide along the same lines and richly illustrated by Fergal MacCabe. Now with thanks to the Rotary Club and Tullamore Credit Union, the walking guide enters the 21st century in the form of a downloadable app for smartphones and tablets. 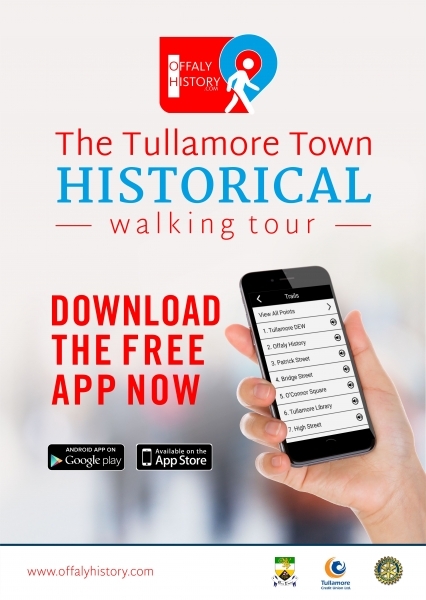 Now you will be able to take a walk through Tullamore and listen to the history of the town at your leisure. Great for locals and visitors alike.